What makes SoC interesting in IoT innovation? The impending IoT boom has kickstarted innovation across various industries. It is estimated that there will be more than 21 billion IoT devices by 2025. These will be used in every industry – from consumer electronics to healthcare. The semiconductor industry has a critical role to play in developing solutions that will meet the future demands of IoT applications. 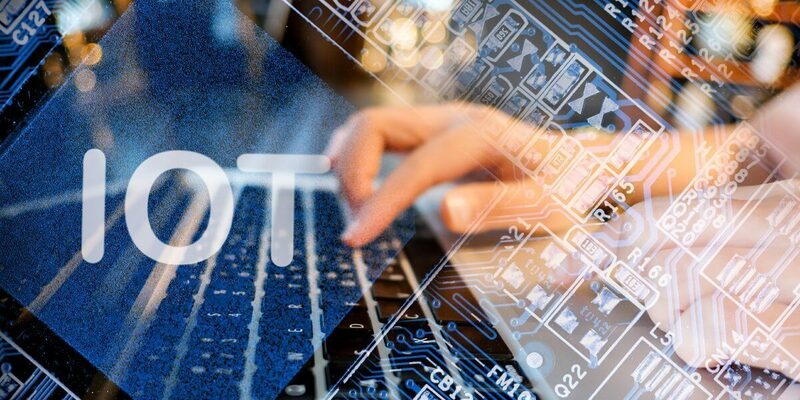 Advanced silicon implementations for IoT devices will enable the next evolution of interconnectedness, including connected cities and industrial IoT (IIoT). System-on-Chip (SoC) is a pivotal silicon implementation driving this transformation. SoC combines the functionalities of sensors and computing resources into a single chip, enabling more power-efficient, compact and secure devices. SoCs pack processors (MCU), RF transceivers, memory, power management, connectivity, and sensors such as such as accelerometers, MEMs, and strain gauges in a single unit. However, getting SoC implementation right requires specialized skills and design expertise. 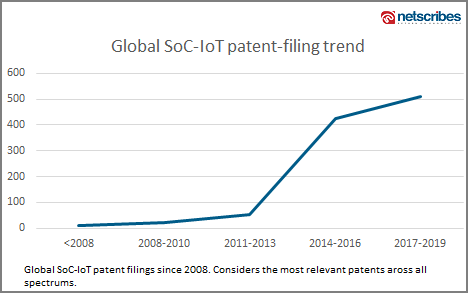 Our IP research shows that patenting in the SoC-IoT segment has grown significantly over the past 10 years. Here’s a look at the global SoC-IoT patent filing trend across all spectrums, including semiconductor manufacturers, application and service providers, component manufacturers, and tech companies. 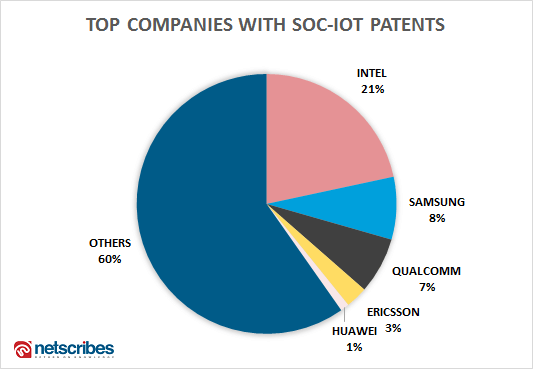 Tech giants like Intel, Samsung, Qualcomm, Ericsson and Huawei own a majority of SoC-IoT patents with a combined share of 40%. Other well-known companies with SoC-IoT patents include Google, Microsoft, Sony, and McAfee. Why is SoC important in the evolution of IoT? Hardware design and device integration is a perpetual challenge facing the semiconductor industry. As consumers expect more compact and multi-function capabilities from IoT devices, the semiconductor industry needs to constantly innovate to develop chips with an ultra-small form factor, low power consumption and multiple wireless connectivity options. Innovators across the globe are working on advanced silicon implementations with an aim to solve these challenges. Some of the notable ones include application-specific integrated circuits (ASICs), SoC, and system-in-package (SiP) technologies. While both ASIC/SoC and SiP approaches have different sets of advantages and disadvantages, SoCs are more power-efficient, making them a favored choice for IoT devices. As companies continue to innovate novel SoC solutions, this technology will define future applications in the IoT ecosystem. Qualcomm developed the QCA4020 tri-mode connectivity system-on-chip (SoC) – a connectivity solution that integrates three major radios in one low-power, cost-optimized chip – to address complexities in inter-device communications. But it’s not just large tech giants that are working heavily in IoT-SoC innovation. A large part of the innovation has been coming from start-up companies with significant disruptive capabilities. RivieraWaves’ CEVA Bluetooth IP offers a comprehensive suite of IPs and platforms for embedding Bluetooth 5.1 – both low energy (BLE) and dual mode (BTDM) versions – into SoC/ASSP. Implementation: What are the IoT SoC design best-practices? What are the advantages, limitations and complexities designers will face in SoC implementations? What potential pitfalls can they avoid? Technology investments: Which vendor companies are at the forefront of developing SoCs for IoT applications? Are certain companies better than others and in what way? Which vendors will best meet different operational requirements? Competitive landscape: What are the leading companies with SoC-IoT capabilities? Which start-ups pose a disruptive threat? The future of IoT: What technology changes will play a critical role in shaping the next generation of IoT products? Netscribes helps companies achieve innovation leadership by forecasting the direction of technological change based on extensive research and analysis. If you’re a company looking for accurate technology insights to steer your innovation strategically, write to us at [email protected].